Rigol DG5000 is a multifunctional generator that combined many functions in one, including Function Generator, Arbitrary Waveform Generator, IQ Baseband Source/IQ IF Source, Frequency Hopping Source (optional) and Pattern Generator (optional). 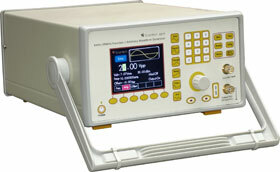 It provides single and dual channel models. Rigol DG5000 is the dual channel model, with two channels having complete equivalent functions and a precisely adjustable phase deviation between the two channels, is a real dual channel signal generator. Rigol DG5000, adopting the Direct Digital Synthesizer (DDS) technology, can provide stable, precise, pure and low distortion signal. The user-friendly interface design and panel layout being users exceptional experience. Besides, the remote control of the generator can be easily done through different standard configuration interfaces, which provides more solutions for users. 4.3 inches, 16M true color TFT LCD. 350 MHz, 250 MHz, or 100 MHz or 70 MHz maximum sine output frequency, 1GSa/s sample rate, 14 bits resolution. Single/dual channel models. 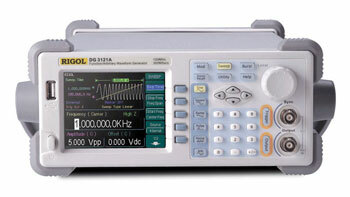 The dual channel model supports frequency and phase coupling. The 16+2 channels digital output module (optional) together with the analog channel can rebuild the more mixed signals in daily practice. Support an external power amplifier (optional) that can be configured online. Rigol DG5000 support frequency hopping(optional) with hopping interval up to 80 ns and arbitrary editing frequency hopping patterns. 14 standard waveform functions: Sine,Square,Ramp,Pules,Noise,Sinc,Exponential Rise,Exponential Fall,ECG,Gauss,Haversune, Lorentz,Dual Tones and DC. Enable to edit arbitrary waveform up to 512kpts in instrument and edit arbitrary waveforms up to 128Mpts in PC. Rigol DG5000 support AM,FM,PM,ASK,FSK,PSK and PWM modulations.